So who are Face Lace? Well the lady behind Face Lace is none other than Phyllis Cohen, something of a legend in the world of make-up artistry, a self-confessed face fanatic who has worked with an eclectic mix of celebs from David Bowie to Heston Blumenthal(?! ), from Kelly Holmes to Chaka Khan and Pink Floyd to Tina Turner. Crazy! What fascinates me about Phyllis is she's self-taught as a make-up artist, transforming her training in the arts from the canvas to the face, and the dedication and devotion put in to making that transition. 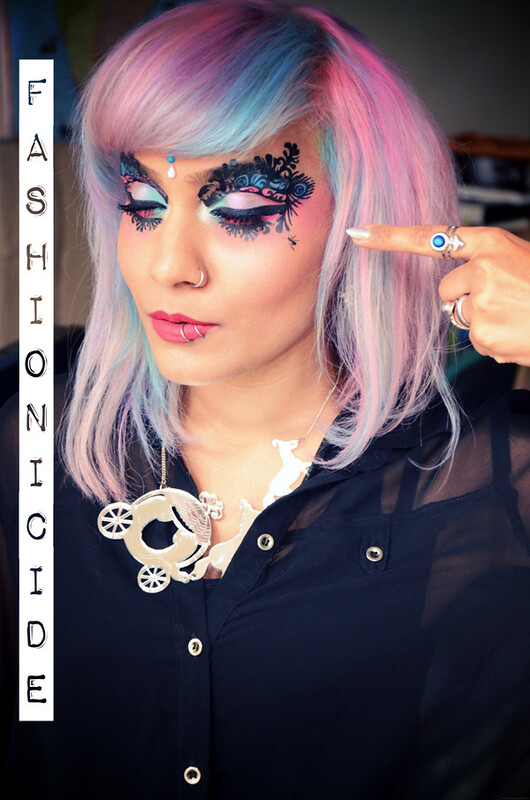 I first featured Face Lace a couple of months back, using their Splash stickers on my face to create a Monochromatic look: LINK. Since then, I've been doing a bit more dabbling, away from the 'DIY' kits towards the ready-to-wear stickers. The one I have on today is called *'Burlesque'. At first I thought there was a sneaky hint of peacock feathers, but upon closer inspection it seemed to more resemble the feather bustle skirts worn by burlesque dancers. No idea why it didn't click immediately, what with the name and all. I've ran out of poses, 'kay? I teamed up the *Burlesque stickers with a shadow combo of lavender, aqua and fuchsia - all colours I'm definitely feeling at the moment. I've temporarily moved away from the increasingly popular lime green and pink combination, I just can't sit still when it comes to eyeshadows at the moment! Lucky little me managed to bag myself and LaaLaa Monroe a couple of passes to IMATS, on the Friday before it all gets crazy-busy. Phyllis invited us both down for the day, most of which was spent splurging, chatting, playing around with the stickers and hugging - as you can see below! At the counter people had the chance to experiment with the stickers, to see what they looked and felt like on. Me and LaaLaa opted for the 'Beauty Sparks' and LaaLaa wore the metallic silver stick-on brows that were on offer. 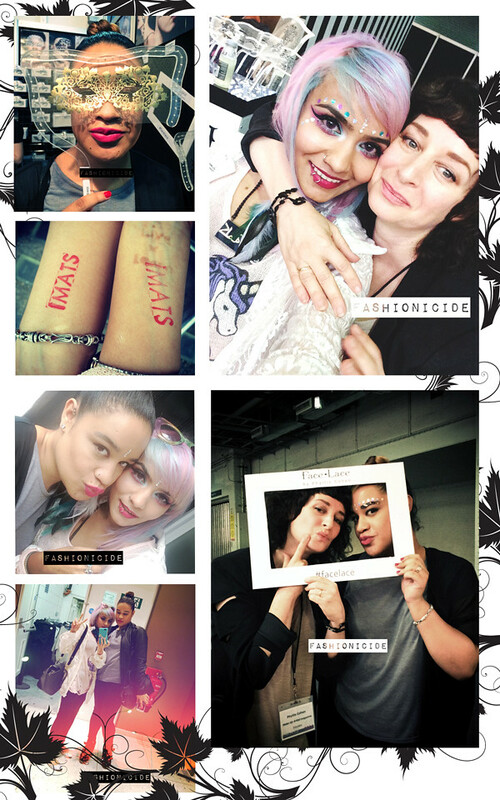 I'd never been to IMATS before so it was quite an experience, meeting and talking to people in the make-up industry. It's a shame that so many of them aren't as well known as their talent deserves, with blogs on a seemingly never-ending rise in popularity a lot of these make-up artists are bypassed. Funnily enough, whilst we were waiting for the tube to the train station, we got chatting to a girl that's looking into creating a blog and the first question she asked was: do you make much money from it? Make of that what you will. 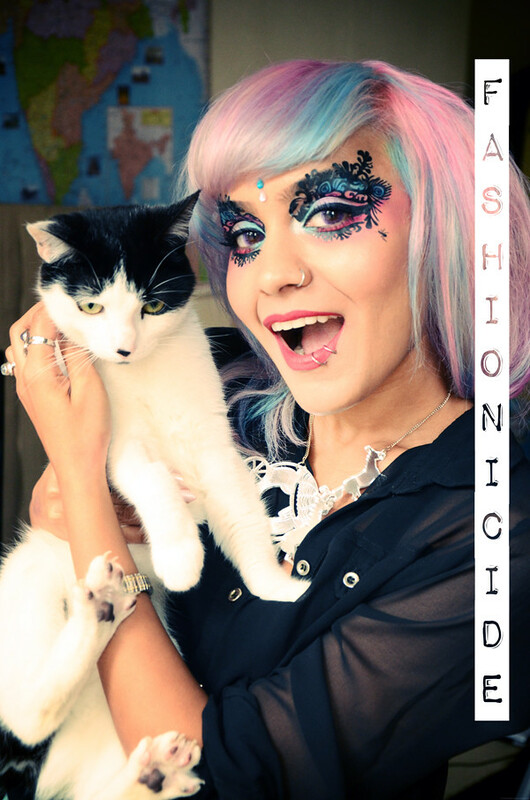 Face Lace can be purchased online through their website as well as via various department stores. Prices range from £3.95 to £29.95. So stunning. This is a work of art in itself. Beautiful! They are pretty cool, would be great for photoshoots and beauty pictures! 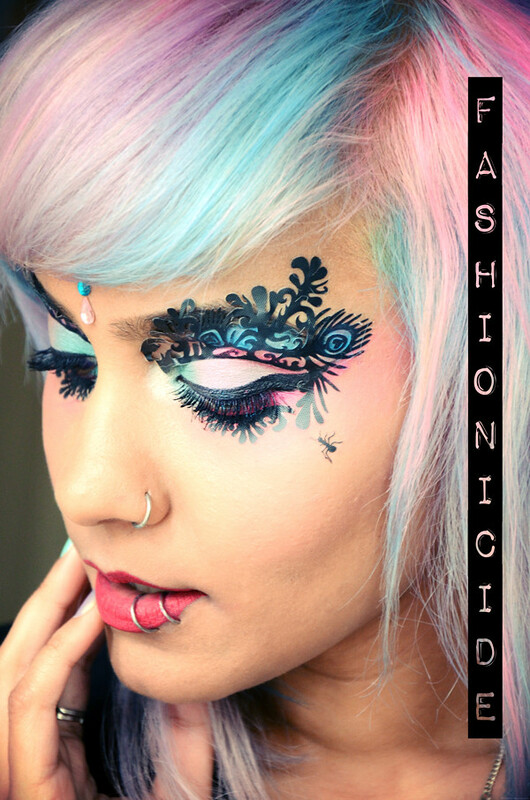 Oh my, that eye lace with those colors beneath just look magical! You look like you've stepped out of a whimsical Aladdin film! Love it and I'm so jealous you went to IMATS! I can't wait to attend one! 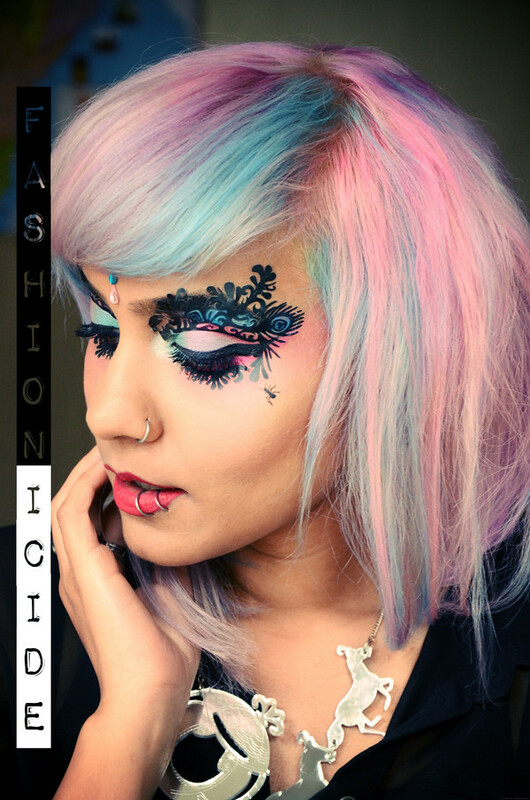 Love the eyeshadow colours and the combination of the eye makeup! I love this, it looks like beautiful art! Your posts are so inspiring! You look beautiful and so fierce. It makes me want to be bolder and more daring. Although not specifically like this as I actually freak out over stickers touching me. A bit like some people do with spiders, I hate the thought of them on my skin. Cause I'm weird like that. But they look incredible on you. That looks so completely incredible!